It's no wonder that audiences have been clamoring for a Mirror's Edge sequel since its release in 2008. DICE's brief detour from their best-selling Battlefield series was a slick, inventive, and gorgeous video game. Unfortunately, it didn't sell well—not surprising for a $60 game that was only about six hours long. Mirror's Edge is a first-person action game about flow. It's at its most fun when you're climbing, jumping, and running your way through a virtual obstacle course. It stops being fun when you stop moving. Consider the gaming landscape in 2008, especially first-person shooters. Developers were releasing games like Call of Duty: World at War and Brothers in Arms: Hell's Highway. Crytek's Crysis: Warhead launched just a year after the first game, as did GSC Game World's S.T.A.L.K.E.R. : Clear Sky. Ubisoft's African-set Far Cry 2 released to the acclaim of some and the consternation of others. Mirror's Edge is nothing like them. In 2008, shooters largely focused on a kind of 'start and stop' gameplay. Most still do. Players make their way to an encounter, decide how to deal with it, and then engage. How you got to where you were going could be interesting, but your decisions rarely boiled down to more than "I want to go in that basic direction" or "I want to get to that particular spot." Much of the meaning in these games could be found in the stories that emerged along the way, but even then, the gameplay loop was: approach, assess, engage. With Mirror's Edge, the destination was the journey itself. The story, one about a dystopian future and couriers being its last hope for survival, was paper-thin. Even the objectives—the things you'd use your gaming skills to run to—amounted to simple barely-interactive cutscenes. They didn't matter all that much. What matters in Mirror's Edge comes up during all the running you do—the choices about how to handle individual motions, a stride, a vault and a lunging grasp at a time. Out of all the levels in Mirror's Edge, Jacknife is my favorite. Like The Silent Cartographer in Halo, it's representative of the rest of game: from its successes in both flow and breathtaking leaps to its failures, namely its gunfights. In Mirror's Edge's second chapter, a former runner, Jacknife, has information that's crucial to you. You've got to go find him. It's a nice, simple objective. The city in Mirror's Edge is too clean to feel human and too caged by barbed wire—even on the rooftops you often run across—to feel welcoming. This is not a pleasant place, especially for a runner like Faith, the game's player-character. Speakers in the city streets blare warnings that attempt to frame you for someone's murder. Yup, it's a dystopia alright. In a game about free running, a dystopia that targets free runners makes a lot of mechanical sense. There's barbed wire everywhere, discouraging you from climbing the chain-link fences that define your boundaries. If you've ever climbed a chain-link fence, you know how clumsy and awkward you can feel while doing it. For a game that's all about flow, chain link fences wouldn't be that fun to climb, so Mirror's Edge cuts you off by sticking barbed wire at the top of a lot of them. It's a great way to say "hey. Don't do this. Do something else. Do something that lets you have flow." DICE could have lined their playing fields with regular walls, but doing so would have made the game's maps feel more claustrophobic. Because you can see through chain link fences but not climb them, the world feels a lot larger and more open while providing a realistic reason for not being able to go places you might otherwise be able to go. Fortunately, to get past this fence, there's usually a pipe you can climb. One of the cooler mechanics in Mirror's Edge is something called "runner vision," where objects that help you progress are highlighted in red. In this case, we can climb those pipes, so we see them as red. At one point in the game, one of the news feeds in an elevator mentions that one of the ways to spot a runner is to note their fondness for the color red. Red, of course, is the most attractive color to the human brain. It's a lesson I learned quite some time ago from an art teacher. If you want to draw someone's attention, a portrait painter once taught me, use red. It's why so many businesses have red signs as opposed to blue ones—they grab attention. Not only is red more extremely noticeable, it also has another strength. In Mirror's Edge, the color red stands out from the rest of the world. Why?. In design school, students are taught that cool colors on warm backgrounds "sink in," while warm colors on cool backgrounds "pop out." The color red is immediately noticeable, screaming "hey, over here!" Once you've gotten good at the game, of course, you can turn runner vision off, but it's a great way to get a handle on Mirror's Edge, especially at the beginning. Plus, it's aesthetically appealing. Look off to the left and you'll see a red pole. Leap to it, swing across—make sure you've got enough momentum, of course—grab onto the air conditioner, shimmy around it, leap to the next pole, and drop down. Congratulations, you've made it past a fence! I realize that can sound sarcastic, but that's the joy of Mirror's Edge. In any other game, getting past thefence mentioned above might be trivial. Here, it's a series of distinct motions. Find the object, climb the object, time the jump right, maintain momentum, leap, shimmy, leap again, drop. There's a distinct rhythm here, and once you find your groove, even something this mundane can seem super fun. Now you've got another fence, but this time, you can dash up to the wall, run up it a bit and use it to leap over the fence. Then the police start yelling at you. Uh-oh. These guys aren't messing around. Fortunately, on the other side of the fence is some sort of water runoff channel. You must dash through it, but there are plenty of ways to do so while maintaining your flow. Just try not to get shot by the snipers the police have called in. I have no idea what I'd see if I turned around—I'm too busy running forward to take a look back—but based on the game's rich soundscape, I think I'd see dozens of police, police cars, police snipers, and, yes, a helicopter. All them for little old me? Gosh. There's no way up out of the canal, but run long enough and you'll find an exit into a very, very blue room blocked off by a broken steam vent. Seriously, it's the most blue room I have ever encountered in a video game. Of course, this makes it easy to spot the bright red valve that can shut off the steam, but it looks nice, too. This approach to visuals is one of the things that sets Mirror's Edge apart. As we saw with the color red, it serves a distinctive gameplay purpose—the color shows us where to go—but it also gives the game a distinctive visual style. It's just as important for a game to look good as it is for that game to look unique, and Mirror's Edge has that in spades. But, more importantly, the distinctive color improves decision-making. Players can quickly determine which objects they need to maintain forward momentum. That creates a better play experience. It's actually why I'm a bit concerned about all the Mirror's Edge 2 footage and screens I've seen. Sure, it's a work in progress, but every single image we've seen so far has given the impression that we're going to get a less eye-popping, less saturated visual style. It looks nice, but Mirror's Edge had ultra-clear communication and a distinct color saturation that the new game doesn't. The colors in Mirror's Edge 2 preview images look washed-out and bland, and I worry this might negatively impact the gameplay experience. Back to Jacknife: Once you've shut off the steam, it's up some more pipes and into an air vent. I messed up somehow and ended up gripping the ledge at the top of the air vent and was unable to climb in it. I had to leap to the poles, then turn back and try the ledge again. It seems like a small problem. Once you've made it through the air vent, punch your way through a door (instead of using the regular interact key, you actually use your attack key to preserve momentum) to find a wonderfully large hole in the ground. Actually, this is why I love Jacknife. Each level in Mirror's Edge has a distinct personality, and Jacknife's is all about cool blues and greens set in surprisingly huge environments. I think it's the best-looking level in the game. Leap onto some eye-grabbingly red shipping containers, jump onto some hanging platforms, and begin your descent into the sewers. Narratively, it's supposed to be a way to avoid the police, but who really cares? There's a giant hole in the ground, and you get to descend into it. Following a series of platforms, poles, and pipes, you quickly make your way down. If you're good, you can do the entire sequence without stopping. It's one continuous flow downwards. Mess up the timing of a roll or misjudge a jump, and you'll take a huge hit to health and momentum. At worst, you'll die and have to start back over. This descent is one of those "you had to be there" moments. It looks cool to watch, but it's a heck of a lot more fun to play. Get to the bottom, hit a switch, and watch as the gigantic flood gates open. Actually, it's best not to watch—the doors are on a fifteen minute timer. Use your best wallruns and leaps to get in before it shuts. The first time I tried it, I leaped directly across a chasm and Faith nearly fell off the ledge. I mistimed another climb, and she had to slowly pull herself up. It was agonizing. As soon as I broke my momentum, the gameplay flow broke down ,and Mirror's Edge stopped being fun. The second time, I ran along the wall, arced around, built up my momentum, and used it to leap up. In a matter of seconds, I'd managed to get to the same place but to do without frustration. 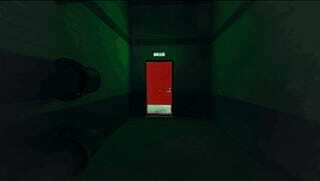 Passing through the door, you'll enter a sort of airlock. Another massive door waits. To open it, you'll have to climb up to a catwalk. Problem is, you've got no pipes to climb or springboards to use. All you've got is a wall that's angled out into an otherwise straight hallway. One move in your bag of tricks is the Q key. Press it and Faith will turn a hundred and eighty degrees. It helps you access areas you might not otherwise reach. This wall is just wide enough for you to use, but not too wide for you to miss your mark. Imagine this same hallway without that angled wall. You'd have to find the right spot of the wall to run up and jump off. By having it jut out in the middle of nowhere, DICE has given us something that serves the gameplay flow well. We know right where to go. Run up it, turn around, jump across, grab the ladder, use a pipe to fling yourself across to the next catwalk, press a button, leap down… and the massive metal door will open, a parting curtain to reveal a breathtaking sight. Time to enter the sewer's huge heart. As with Half-Life, this may seem like an unrealistic, needless room, but such a place actually exists. This room is modeled after a tsunami drainage system in Japan. Just the kind of place you'd expect to manage the kind of water volume that accompanies a tsunami. Both the real-life and virtual version are gorgeous, though Mirror's Edge's is much more colorful. For a sewer, the water throughout looks positively pristine. It seems like the kind of place we want to be, rather than a place we want to escape. 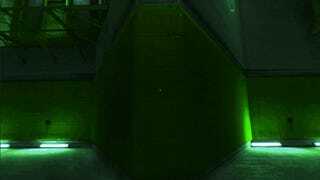 These tunnels are color-coded green, and in this room, Mirror's Edge's prebaked lighting works to wonderful effect, tinting everything slightly green without making it seem sickly. Far off in the distance, you can see a door. The room establishes its goal clearly: get to that door and get out. A small red ladder, red being the opposite of green on the color wheel, catches our attention. A room this big can seem intimidating, but the red ladder assures us. We know what to do here, so we run straight for it. I can't think of a single time I've tried to explore the main floor of the sewers—I've always run right for the ladder and begun climbing it, which is, of course, precisely what Mirror's Edge wants us to do. You begin looping around the massive concrete columns that fill the room, making our way up. The jumps are simple at first, but then we're introduced to a balance beam. It's a new method of traversal for the level, and it's different because it slows you down without breaking your flow. There's a new kind of risk here—a worry about height. As you climb up, the jumps get farther apart. Where the descent into the sewers was all about small platforms, good timing, and wall-running, this room's all about running forward, building up momentum, and taking breathtaking leaps. The higher up you go, the scarier it gets, but the path breaks things up in such a way that it feels like each step closer to the goal is more dangerous than the last. Then the game adds in snipers. One of them shoots a rat dead right in front of you. Best to ignore them and keep moving, even if one of them did just say "shoot to kill." Your guide radios you, telling you to ignore them or engage—it's your choice. The first sniper you encounter, however, appears to be unavoidable. Frustratingly, he impedes your forward momentum somewhat. He's just one guy, though, and he's easily dealt with. Now you're at the top. You can jump from column to column, exploring the columns above much like you could explore the sewers below, but it's best to make your way toward the exit. Mirror's Edge's level designers were kind enough to highlight your goal by making it the lighter side of the room. Head toward the dark areas, you're going the wrong way. Move to the lighter areas, and you're moving in the right direction. The game also highlights the sniper positions somewhat, giving you a good impression of where they are. You'll find a zipline. Taking it will get you close to the door, but you'll have to shimmy across a narrow ledge to do so. Why is this necessary? Why couldn't the designers have just let you land right at the door? This is actually a neat bit of storytelling on their part: shimmying across the ledge requires you to look back at the room you just successfully cleared, and this serves two purposes. First, it lets you go "wow, I made it through that!" It's one last look at a tremendous obstacle, and it makes you feel good about yourself. Second, you'll see a bunch of flashlights—presumably attached to people—entering the room. It adds impetus to push forward, a good reminder that you're still being chased. Static snipers are one thing, but these guys are on the move. Smack a button and enter a new room. This one's simple: leap up to a ledge, turn around, and leap up to another. Easy-peasy. Then you get to take a water-slide. In any other situation, a waterslide might sound fun. This one has a bottomless pit at the bottom. I take issue with whoever designed this section. Each time I attempted to use the momentum of the slide to leap across the chasm, I died. In a game that's all about momentum up to this point—and featured a sequence virtually identical to this in the previous chapter (that one had you sliding down the glass face of a skyscraper), the impression is given that the player is supposed to slide down, hit jump at the last second, and leap across the chasm to safety. Passing this obstacle is somewhat counterintuitive. The only way I managed to survive it was to take damage, then wall-run around. Mirror's Edge provides a ledge to ease across, but I like speed, and wall-running is fun. When a designer deals damage to the player, that's usually a warning sign that the player has made a mistake. For this particular obstacle, it seems that coming to an abrupt stop before falling down the chasm and taking damage is actually the way to go. It's a weird wrinkle in the experience. Press an emergency release button, open the giant metal door standing in front of you, and you'll find yourself in another giant pit, this time at the bottom. Climb up to the top, clambering across construction elevators, pipes, and platforms, at one point shutting off some water valves, and you'll find a button. As with all buttons, you should press it. Leap onto a hanging platform, and you'll see that a crane is bringing up another one. Time it right, leap onto the second platform, and let it carry you to the top, where you can escape the sewer drain and find yourself accosted by a bunch of very angry men with guns. I despise this sequence. Most people do. I read a comment on a Mirror's Edge 2 video earlier that said something like "if DICE includes guns in this game, I'll lose faith in them entirely." For most people, Mirror's Edge is a great game aside from the fights with police, and while I agree that the fights with police are bad, I would hardly advocate their removal, not when I could argue for their improvement. At its core, there's nothing wrong with spicing up gameplay with something you can fail. The problem with fighting cops in Mirror's Edge is that Faith, despite being an incredible and presumably strong athlete, seems incapable of bringing the hurt to anyone she hits. Furthermore, she seems incapable of movement at all if she picks up a gun. It's not that guns are bad, it's that the way guns work in this game is bad. Arguing to remove guns entirely is like arguing to remove the Mako in Mass Effect. The Mako wasn't the problem; the terrain was. Make better terrain, and the Mako rounds out the game. With Mirror's Edge, make Faith a better fighter, and fights can round out the game experience. In fact, guns can absolutely make Mirror's Edge a better game. Here's how. All first-person games, in some way, are about movement. Some time in the late-90s, shooter design shifted to be more "realistic," as if anything aside from a simulator could be truly "realistic." 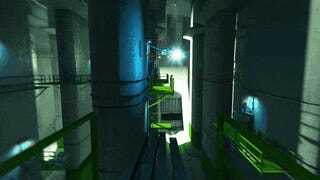 What that meant was that shooters got a lot more flat in their level design. The gameplay slowed down. Enemies transitioned from obstacles that influenced your movement in games like in Doom to things that encouraged shooting gallery style pop-n-stop play, such as games like Call of Duty. There's nothing inherently wrong with this—in a game set in World War II, as Call of Duty was, dodging bullets is pretty hard. In a game like Doom, where demons vomit fire at you, developers can get a bit more creative. Plus, I've heard from some developers that hit-scan weapons are easier to deal with in-game, especially in regards to multiplayer. I've also heard that it's better for consoles, where player movement is inherently limited by the use of analog sticks. Unfortunately, "realistic" has always been an attractive idea in games—every graphical showcase, for instance, talks about how 'realistic' it is and has since the dawn of video games. At one point, this was "as real as it gets." Mirror's Edge certainly isn't realistic, even if it's got realistic locales, and that's what makes it fun. It's a game about doing all sorts of seemingly-plausible but ultimately-unrealistic things for the sake of fun gameplay. Most of the response I've seen regarding Faith's use of guns is that it's "realistic," so of course it's bad. But in a game all about flow, it might be best to eschew realism, especially when it gets in the way of good flow. Faith could be more quick to dodge cops. The cops could more visibly telegraph their actions, alerting the player to the actions they need to take. Disarming cops could be a bit more generous. Then there's all the things Faith could do with guns. She could actually use guns to manipulate the environment, opening up new methods of movement. All the stuff she does to move about in the game could be enhanced by guns. They don't need to slow her down or hurt the gameplay experience, because there's no reason for this to be the case. It's an unrealistic game. It's at its best when that's the case. Gun fights could be used to impact flow in positive ways, rather than negative ones. Giving Faith things to dodge or new ways to interact with the environment is good. Once you've dispatched the cops, you've… got to find a way out. I always get stuck at this part. There's a door you need to get to, but it's not as easily visible as others are in the game. It's almost as frustrating running around, trying to figure out where to go, as it is fighting the cops. Once you do figure out that you've got to climb up a truck, leap over a fence, and open a door, all becomes clear. Find the elevator, and the game slows down, because you can't exactly do any cool parkour stuff in an elevator. Ride it to the top, exit the elevator, follow a hallway, open a door, and you'll meet Jacknife, who is a bit of a jerk. He also decides to run away from you. What else do you do but give chase? Up until now, the primary impetus for your forward momentum has been "people are shooting!" Now it's "that guy is running away!" You stop being prey and become a predator, and its your job to chase Jacknife, who occasionally stops to taunt you. The level also starts to become increasingly orange the further you go, establishing a new identity, one that will pop up in later levels. The chase is unremarkable, aside from the fact that there are multiple ways to do it, though they rarely diverge in any meaningful way. The outcome is always the same—Jacknife arrives at a pre-defined location, makes a bad jump, and you have to make a slight detour to get to him. This is my least-favorite part in the level. Yes, even less so than the gunfight. Remember that one area earlier, the bit in the sewer 'airlock' where we had to run up a wall, turn around, and hit the ladder? This should have had something like that—some precise area to go to make a good jump, but it doesn't. Nearly every jump I made to the bright red pole I was supposed to get to killed me. I'm pretty sure Faith actually hit and bounced off the pole a few times, rather than grabbing on. I finally found a solution by running slightly toward the wall the pole came out of. It feels weird and awkward and unclear, unlike most everything else in the game. This is followed by some basic pipe navigation. That's fine. You've done a bunch of it throughout the game. Shouldn't be a problem. In this situation, at least for me, it was. For whatever reason, Faith kept trying to jump between the third pipe and the wall rather than actually grabbing the pipe. That caused her to fall to an untimely death, which started me back on the roof before the troublesome pole, so I'd have to navigate it and the poles all over again. This was not a fun sequence. Once you've navigated the roof, get to Jacknife, who will tell you about the target of your next level and generally just be a bit of a jerk. Whatever. Level's over. Didn't end on the best possible note, but it was still fun. This flow, this focus on each individual movement, is what makes Mirror's Edge special. It's as much a rhythm game as anything else. Mirror's Edge is not about encounter design, like Far Cry 2 or Crysis: Warhead . Those games aren't bad, of course—many of them are the best games in their respective franchises—but the gameplay they're trying to provide is different. 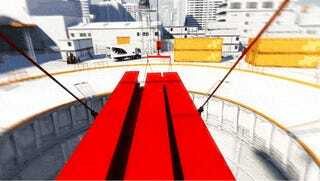 Mirror's Edge is all about flow. It's not about planning how to tackle an encounter, but about picking your next move and doing it quickly enough that you move from one point to another without interruption. Where those games were about encounters that stop you from moving, Mirror's Edge is a game where stopping to make a decision is a bad thing. It requires a different kind of intelligence of the player, and that's what makes it such a special game. There's nothing out there quite like it. GB Burford is a freelance journalist and indie game developer who just can't get enough of exploring why games work. You can reach him on Twitter at @ForgetAmnesia or on his blog. You can support him and even suggest games to write about over at his Patreon. For more of his Kotaku work, check out the GBB tag.